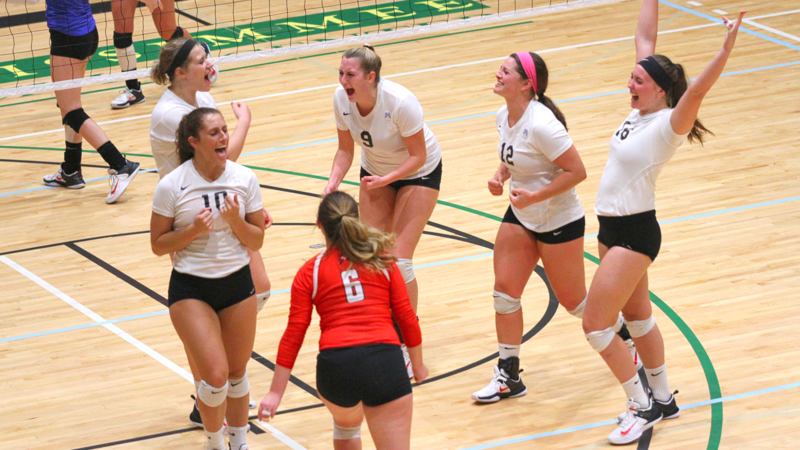 Grace College’s volleyball team kicked off the 2017 NCCAA National Championships with a win and a loss on Thursday. The Lady Lancers lost to No. 4 Emmanuel 3-0 before downing No. 9 Bluefield 3-1 in the nightcap at the Kissimmee Civic Center. Grace ends pool play on Friday, playing No. 1 Biola at 10 a.m. and No. 5 McMurry at 2 p.m. Grace needs to win both matches to guarantee a spot in the national semifinals. The winner of the pool along with the runner-up reach Saturday’s final four. Slow starts doomed Grace in the national tournament opener against Emmanuel. The Lady Lancers (22-16) fell behind 7-0 before a Sierra Smith kill got Grace on the scoreboard. Grace battled back but could not get within three points of the Lions’ lead, falling 25-20. The Lady Lancers endured another sluggish start in the second set. Emmanuel grabbed a 7-2 lead before Grace gradually clawed back into contention. Grace used a 6-1 run to tie the score at 19-19 off a kill from Savannah Hart, but the Lions rattled off four straight points and won 25-20. Smith earned a kill on the first point of the third set for Grace’s first lead of the match, but the Lions quickly regained the lead. Emmanuel surged ahead 18-9, but Grace again came back. The Lady Lancers used an 8-1 run to tie the score at 23-23, sparked by two kills off the bench from Lexy Oppenhuis. But Grace lost the set with two straight attack errors to fall 25-23. Grace had three more kills in the match (37-34), but the Lions enjoyed 11 service aces and hit six fewer attack errors in an efficient outing. Smith’s nine kills and Kelsee Zuidema‘s eight kills led Grace, Alexa Hill had 35 assists, Sara Miller produced 10 digs, and Hart added seven kills. Grace wasted little time beating Bluefield in the first set. The Lady Lancers won 25-14 on a kill from Zuidema. The Rams were held to six kills compared to 15 for Grace. The Lady Lancers led for the majority of the second set but struggled to build up a sizable cushion. Nine attack errors hurt Grace’s cause, and Bluefield snuck away with a 27-25 win to even the match. Grace’s retribution was swift in the third set with a nine-point win. The Lady Lancers’ offense was dominant with 12 kills on a .417 percentage. In the fourth set, the score was knotted 17-17. Zuidema helped Grace pull away down the stretch, producing four kills and a block in the final points en route to a 25-20 victory. Zuidema racked up 21 kills, her second-highest total of the season. She hit at a .436 percentage to go along with four aces and four digs. Marta Bleed had 10 kills, and Hart added nine kills and four aces. Tori Bontrager tallied 9 kills, 2 solo blocks and 1 block assist, and Hill passed out 46 assists.